Transcend Information Inc., a leading manufacturer of storage and multimedia products, today announced two new additions to its StoreJet Cloud family: the 1-bay SJC110N and 2-bay SJC210N. Available in 4TB and 8TB capacities, Transcend's new Personal Cloud Storage products are equipped with NAS-grade HDDs to deliver optimum performance and reliability in a 24/7 environment, as well as easy file sharing, one-touch data backup, cloud storage syncing, media streaming, and more. Friends and family can create their own accounts on the StoreJet Cloud to securely share photos, videos, music and other files either by URL links or public folder. Each account is individually maintained and securely protected, allowing users to freely access their personal content over the Internet through the StoreJet Cloud mobile app (iOS/Android) and web link. With up to 8TB of centralized storage, the StoreJet Cloud can back up files on PC and Mac computers. In addition to Windows and Apple Time Machine backups, the StoreJet Cloud supports one-touch backup from USB storage devices via the rear USB 3.0 port, and will even charge your iOS and Android device during backup of photos and videos. Also new to the StoreJet Cloud is the ability to sync with cloud storage services like Dropbox and Google Drive. Both the StoreJet Cloud mobile app and web link received a UI refresh, allowing for quick setup, automatic backup, data management, media streaming and remote access of digital files stored on the StoreJet Cloud. Powered by dual-core ARM Cortex-A7 SoC, Gigabit Ethernet and up to 110MB/s transfer speeds, the StoreJet Cloud ensures smooth media streaming on DLNA-compliant devices, such as smart TVs, Xbox and PlayStation consoles. It also supports AirPlay, iTunes and Chromecast, as well as the playback of media content stored on the StoreJet Cloud via the mobile app. With built-in RAID 1 technology, the 2-bay StoreJet Cloud 210N provides an extra layer of redundancy by mirroring files on two separate disk drives. This ensures data integrity and continued operation in the event of a single drive's failure. 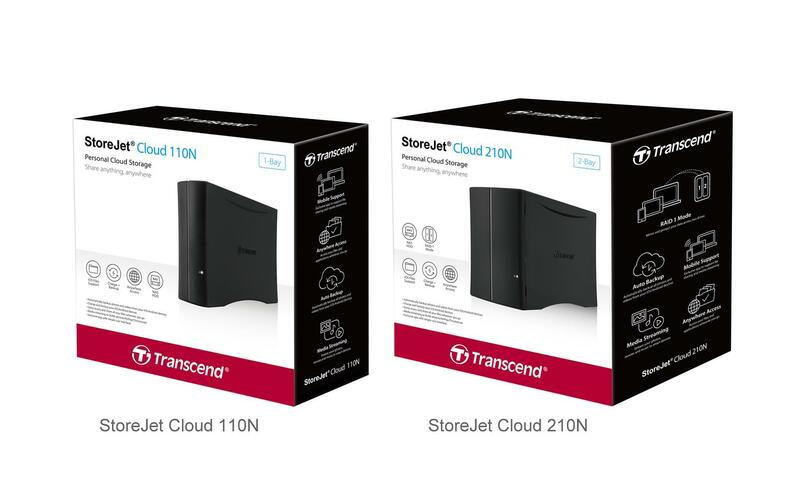 Transcend's StoreJet Cloud 110N and StoreJet Cloud 210N are both backed by Transcend's Two-year Limited Warranty.